We regularly have fruit box delivered to my work and I noticed we had quite a few hard nectarines left. I didn’t want to throw them out so I though surely I can make something with them. I decided to pop them in my salad and they really transformed my healthy Chicken salad into a light freehand tasty summer salad. Perfect for BBQs and healthy dinners. 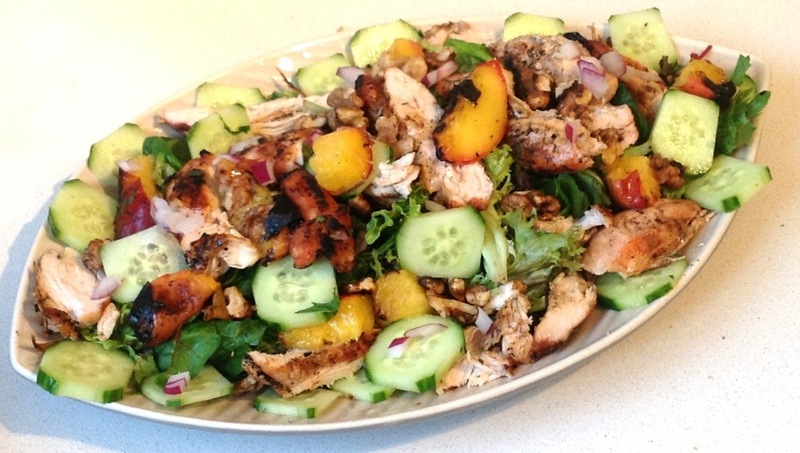 Because the nectarines are so sweet you need a very vinegary dressing and some herbs to counter balance the flavour. I also threw in some roasted walnuts to add as smokey flavour to the freshness. It really is a unique and deliciously fresh salad, I will be bringing this one out in the holidays!! 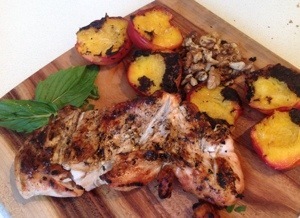 2 nectarines chopped either raw or chopped in half and grilled on BBQ with the chicken. 1/2 cup of vinegar and 1 teaspoon of sugar and a bunch of chopped mint compile to make your mint vinaigrette dressing. Pop your chicken on the BBQ or frying pan and cook till brown. Add your walnuts to the chicken and roast them for a couple of minutes on the hot plate. Wash and tear your lettuce leaves up and dry them off with a paper towel and place in your salad bowl or serving tray. Top the lettuce with thin slices of cucumber and red onion. Once your chicken is cooked slice it up and lay on top of the leaves. Add your nectarine and sprinkle the lot with chopped mint leaves. Pour your mint vinaigrette over the salad and get munching! !